A delicious garlic soup recipe to give you lots of goodness and health benefits. If you have never tasted garlic soup before you will be surprised to find that it is not the strong smelling dish you once thought in fact you would hardly know it is made of garlic. Instead you will find that the soup has a wonderfully exquisite and aromatic taste and smell. This is because the garlic is well cooked and the usual strong smell is at a minimum. Although for some garlic enthusiasts this may not be enough for you! 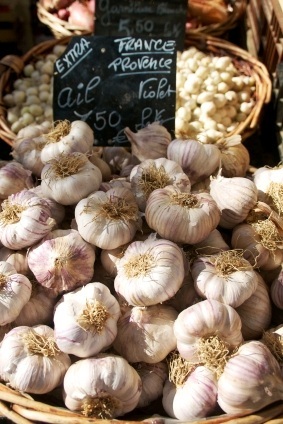 In the south of France, they make a garlic soup called Le Tourin, for which we provide an alternative recipe. 1. Peel the garlic cloves - the quickest way is to drop the cloves into boiling water for about 1 minute then run cold water over them and peel. 2. Place all the ingredients into a large heavy bottomed pan and bring to the boil. Lower the heat and simmer for about 45 minutes. 3. As the soup is cooking, beat or whisk the egg yolks until they are thick. 4. Gradually beat in the olive oil, drop by drop. 5. When you are ready to serve your soup, add a small amount of hot soup to the egg mixture and mix well. Then pour this mixture back into the pan and mix in well. You can strain the soup through a sieve or in a liquidiser to a smooth blend. Serve with rounds of toasted French bread and Parmesan cheese.